Fox School of Wine, formerly Park City School of Wine, is an independent, non-denominational wine education school located in Park City, Utah, that, since October of 2008, has been committed to excellence in the intellectual, ethical, gastronomical and enological development of our students. We offer fun wine education through our our Park City wine tasting classes and tours, our corporate wine productions, and our events. We honor the ideal, articulated by our Headmistress, of "finding the promise" in every glass of wine, and we work together in an atmosphere of mutual trust and shared responsibility to help students explore their taste for bottles of Pinot Noir, Sparkling Wine, wines of South Africa, Sangiovese, and a multitude of others. We seek to inspire a thirst (so to speak) in our students for the whole experience that is wine. Please be comforted by our "No Student Left Behind" policy: If any student needs more wine education, we will stand behind that student with our years of education and will ensure the student is pulled up with the rest of the class. 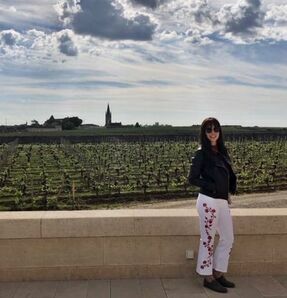 A love of travel, different cultures, world history and wine, is what led Pamela to pursue her passion of all things wine.